Pages from my Heart: SEPTEMBER IS NATIONAL STAMPING MONTH! 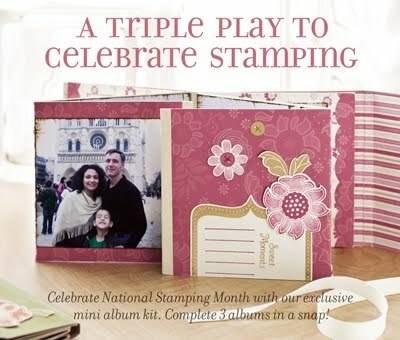 SEPTEMBER IS NATIONAL STAMPING MONTH! Celebrate stamping with a Triple Play! A set of three mini albums to create - includes stamp set, inks, card stock, die cuts, ribbon and instructions. Make up all three with photos and give as Christmas gifts, or purchase kits to give to your favourite scrapbook enthusiast! There are FIVE ways to get this outstanding mini album kit. Check out my website to find out how! $2 $4 $6 for 8 SALE STARTS TODAY!